The long-awaited Eastern Busway is finally a few steps closer with Auckland Transport announcing that some works will be starting soon with the main construction due to start early next year. Work is starting shortly to remove 61 properties as part of the AMETI Eastern Busway route. The properties are all ownaed by Auckland Council and are along the Panmure to Pakuranga stage of AMETI. 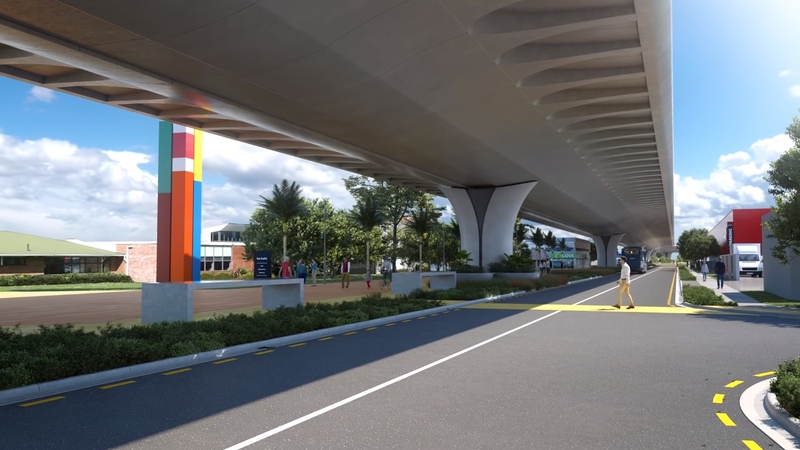 The removal of properties on the northern side of Lagoon Drive and Pakuranga Road will finish by early next year to enable the main construction phase to start in March/April 2019. 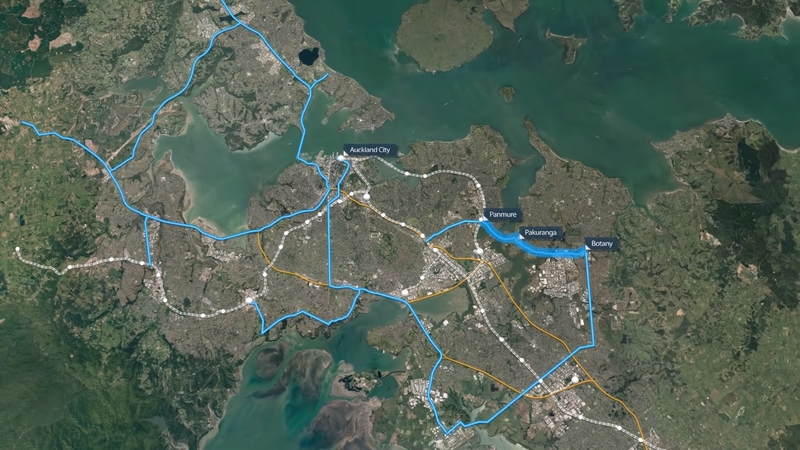 Mayor Phil Goff says, “AMETI will bring high-frequency public transport to East Auckland along with significantly improved facilities for motorists and safer, faster connections for bike riders and walkers. The construction phase will take approximately two years. Parts of Lagoon Drive and Pakuranga Road will be widened to create a dedicated, congestion-free busway, similar to the Northern Busway. Panmure Roundabout will be turned into a safer signalised intersection, there will be new cycle and walking paths, improved public spaces and reserves, a second bridge across Tamaki River and several intersection upgrades. When the $1.4b busway is fully operational, customers will be able to travel between Botany and Britomart, by bus and train, in less than 40 minutes. Fencing has been installed around the first properties to be removed at the corner of Pakuranga Road and Ti Rakau Drive and security and safety measures have been put in place to secure the other properties while the demolition work progresses. Auckland Transport and Panuku have been working closely with social and housing organisations to ensure a smooth transition for tenants of these properties and neighbouring residents. It’s great that this is finally happening, but it sure has taken a long time to get here. The current scheme of an urban busway has been around since about 2010 and the first stage, the upgraded Panmure Station, opened nearly 5 years ago. Earlier this month, Auckland Transport also released a new video for the busway. The video generally features some improved messages to what we’ve seen before. For example, I like that they highlight that by connecting at Panmure, you could get to the city from Botany in less than 40 minutes at peak times. Google suggests at peak that would take about 70 minutes by car. Also that from Botany that they’re looking at options to connect from there to the airport as part of the region’s planned strategic PT network. The map they show does has a few odd links in it though, such as the line from New Lynn to Hillsborough, Light rail down Symonds St and the Northwest to the Shore using the motorway. They mention that the busway will eventually move about 7,500 people in the peak. To put that in perspective, Britomart currently sees just under 9k arrive in the morning peak. This is also another reason why the City Rail Link along with 9-car trains are critical as we will need a lot more capacity on the network. It doesn’t change that it will be a large bulky structure that won’t be pleasant to be under. Perhaps AT is secretly looking to completely pedestrianise Queen St and that’s why they want to shift the LR to Symonds St. That would make for an awkward transfer from NW line though. The Dom Rd – NNRd – Symonds St route is good. The transfer at Mt Eden Station is much closer than K’Rd, and offers a more direct transfer to trains heading in more directions. It will service the area formally covered by the abandoned CRL Newton Station. It runs right past AUT and Auckland Uni. The CBD catchment becomes much greater given its seperation from the CRL stations. Where would the buses that use Symonds St go; the ones that go down Manukau Rd for example, that won’t be replaced by the light rail? Will they fit if general traffic is completely removed from Symonds St? Yeah, there is already a bus a minute on Symonds Street, linking it to just about everywhere in the City Centre and to six main frequent corridors. Why does it need more? I was thinking about NW LR line. Currently the transfer is planned as a walk from Queen St/K’rd intersection to K’rd CRL station. If you move the LR to Symonds St that becomes to far to walk IMHO. People are nicely sheltered, though, at that wonderful potential market space that the flyover will create at Pakuranga. I’m going to suggest to my placemaking group that we should push for a flyover, too. Fantastic sheltered shared pedestrian and vehicle space. What’s not to like? Sorry for being facetious. In the picture of the flyover, a pedestrian is walking on a yellow crossing. Is this part of a yellow way-finding path? How does it work in our road rules? Is it a pedestrian crossing at which a motorist is required to stop? Or is it just a bit of bright colouring for the picture to make the flyover area look less dismal, like the bright multicoloured post thing on the other side of the flyover? It’s because he has yellow pants as only people dressed in yellow can walk on this. It’s a golden brick crossing. Made from all the excess gold plating lying around from this project. From a purely PR point of view this is massively overdue. The Eastside has long felt that PT is irrelevant to their transport experience and people out there have pretty much stayed completely car centric and rather hostile to their rates/taxes being spent on PT. Even Pakuranga MP Simeon Brown is a big supporter of this project. And he is comes from the political party who usually favours roads only. Haven’t you noticed something a little strange about the AMETI project? The public relations stuff suggests that the catchment area for the project is Pakuranga, Highland Park, Howick, Bucklands Beach, Botany Downs and surrounding areas. But the busway doesn’t go there! Instead, once it hits the Pakuranga town centre, it turns south and heads for Dannemora. People in the supposed catchment areas instead get a road flyover that takes them on to the South Eastern Arterial and the Southern Motorway. This seems to suggest that the whole project either is not even intended for Eastside commuters at all, or that the planners and politicians have realised that people in those areas are not going to get out of their cars and catch buses and trains to work under any circumstances. In conjunction with the Busway there will also be buslanes on Pakuranga Rd. This combined with the busway between Pakuranga and Panmure will very definitely benefit bus users in the locations you listed. The benefits of busways extend well beyond the actual corridor as they allow buses to join at any intersection along the busway. Good video with good messages. The cycling is hardly state-of-the-art. Surely there was opportunity to provide better separation than this? Looks like turning right from the highway involves crossing as a pedestrian, and they there don’t seem to be the full suite of legs, so that’ll be limited… anyone have more detail? Yes, like the overall messaging. Not so sure on the authentic Auckland van driver sideswipe maneuver into the cycle lane at 2:28. They say the new bridge at Pakuranga Creek will ease congestion. Is that true? It seems to have the same number of lanes. Had they reduced the number of lanes they could have created some traffic evaporation at the same time as providing this superior access for all users. That would have eased congestion; not here, but elsewhere. It will ease congestion because there will be fewer cars because more people will be catching the bus (or cycling) to the train station in Panmure now. Unfortunately, it doesn’t really work like that. I agree that many people will choose to use the bus (or cycle). Traffic volumes will be lower for a while. But the freed up road space acts like additional road capacity – it induces traffic. So within a few years, it will be just as congested. It is possible to improve public transport and active modes, and have the result that there is less traffic. To achieve this, general traffic road capacity must be reduced at the same time. This wouldn’t result in lower congestion at the spot where the capacity is reduced, although it would be safer for vulnerable users. But it could work to reduce traffic volumes elsewhere, such as on local roads, where those removed car trips came from / went to. It will reduce bus congestion, but then so will the whole busway, I thought it was an odd comment. Yes, for the wise people who choose PT, they’re commute experience will be materially improved, but for car dwellers, Heidi is correct, there will always be people willing to get back into their car or drive more often if they perceive conditions improve, so nothing changes much there in the long run. The only real way to reduce cars clogging the roads is through back pocket pain – congestion charging. The problem with so much of the conversation going on here is that many commenters seem to think that all issues in Panmure must only and exclusively revolve around the demands of city-bound commuters from east of the Tamaki River. The Panmure roundabout does far more than that, offering transport routes in six different directions all the way through the day. Vast numbers of trades and commercial vehicle drivers don’t just catch the bus to work and sit in an office all day. They have plenty of different places to go. But the design of the new busway and intersection will seriously hamper their ability to travel through Panmure and, in many case, force them to fight their way through the Panmure Town Centre and residential roads instead. All those “wise people who choose PT” – among which I assume you include yourself – seems to imply that the huge numbers of people whose working day can’t possibly be done on public transport must somehow be very stupid and inferior. Restricting Jellicoe Rd into the roundabout will effectively give a reduction in road capacity. Looks like only turning left into Queens Rd or a small ability to turn right (I guess?) into a new little road to get to Potaka Lane. If you are coming East of Panmure along Queens Rd you won’t have to fight it out with all the Jellicoe Rd traffic anymore at the roundabout. The issue there is that restricting capacity from Jellicoe Road entering the new intersection doesn’t mean that Jellicoe Road traffic will disappear. It will be forced to take another route through Panmure, and if that route is eastbound – say, towards Pakuranga – the only route left is through the Panmure Town Centre. So while someone coming from the east along Queens Road won’t have to compete with the traffic at Jellicoe, they will instead be forced to compete with it at the even smaller and more difficult roundabout at the east end of the shopping strip. AT’s own figures concede a potential DOUBLING of HCV traffic on that route. Imagine having to compete with more big trucks (and trailers) at the small roundabout at the other end of town. These are the inevitable knock-on effects of the new intersection design to replace the roundabout. Non-city-bound traffic will still have to go somewhere. “The issue there is that restricting capacity from Jellicoe Road entering the new intersection doesn’t mean that Jellicoe Road traffic will disappear.” History has shown that it does. You get what you cater for. Traditional traffic modelling doesn’t account for induced demand or the reverse of that. Only very local traffic will want to go through Queens Rd in that direction as you can go along Lagoon & turn right INTO Jellicoe at the new intersection. I can see where you are coming from and perhaps have drawn the shortest stick if you live around the southern Tamaki area and want to drive through past the roundabout. In every other aspect I think you will win: Better local pedestrian & cycling amenity. Better public transport links & access to them. No one hardly walks around the Panmure roundabout simply because it is such a dividing, dangerous & hideous place for them so tend to use a cars or wait for a bus to get to the station. The 711 should become the 71 and have it’s route simplified with a small bus only bridge over the creek between Hope Farm Ave and La Trobe St. The bridge would be about 50 meters long and only require the purchase of 1 property, while saving 1.4km from the bus route. The 712 should also become the frequent 73. This route would benefit from bus lanes (or even Busway) from Glenmore Rd to Pakuranga Plaza. These changes would ensure that most East Aucklanders live no more than 800 meters from a frequent bus stop. They would also help to reduce overcrowding on the 2 existing frequent routes once the Busway is open. Ideally these routes would be ready to launch in 2020/2021 when the Pakuranga-Panmure section of the Busway opens. “These changes would ensure that most East Aucklanders live no more than 800 meters from a frequent bus stop.” This is a key point, and is what will drive uptake of public transport and reduce our surging CO2 emissions. I think that the percentage of households without access to a frequent stop should be a key peformance indicator for AT, and the expectation on AT should be that it is near zero within a fixed (and small) number of years. % of people close to frequent PT is a key performance indicator; see RPTP for details. Can’t make out from the plans, is the existing path into Bridge St still going to be there ? I certainly hope so.. that access point to Bridge St is one of those little critical links for north / south journeys round here. One of those local gems that makes all the difference for whether cycling is even an option. Or scootering. Or walking or running. If anyone puts together a post on the cycling aspects of AMETI, 🙂 these details would be great to know. I think bike Auckland has an article on their website on this but maybe slightly dated now. The plans show a path of some sort between the shared path and Bridge Street. Classic Auckland, takes 20 years to take one step forward. Yes. Can’t we learn something from this? Converting the general traffic lanes to bus lanes, and giving buses priority at traffic lights should have happened ages ago, to give the residents in East Auckland options to avoid car dependency. Had that happened, this massive project wouldn’t be required. I can think of a number of arterials in Auckland where conversion of general traffic lanes to bus lanes right now will give transport options to many people, and in the process, prevent the need for a major project in the future. Heidi: If you made a bus lane each way over the Panmure bridge then you would have had literally only one lane for all other types of traffic. Yes, but if you made it bus lanes everywhere you *could* a decade or two ago, the travel times for the buses would have been far better than what they were. Therefore PT would have been an option, ie more people would not have been dependent on cars. Lower traffic volumes. And the pinch points could have been dealt with one by one. Perhaps the cycling and walking paths could have taken a slightly different route, with a less expensive active mode bridge somewhere. Perhaps they could have tried a dynamic bus lane on the bridge. 2020 – 2010 = 10 years? From conception to delivery. Where does the 20 years come from? If you check, a PT trip from the Botany bus interchange to Britomart currently takes 50 mins in theory (bus then train from Panmure). After this is built it will take 40 mins, wow all this for 10 mins. Then I thought, it’s also going to be a lot more reliable with less bus bunching, improved amenity for other active modes, and will cater for future growth as well which would kill the current 50 mins anyway. Finally we will have some visibly happening for this project. Peak times on Bus or Train/Bus takes well over an hour. 10 mins is pretty significant, the CRL is knocking 10 mins off journeys from the west for well over $3 billion. Also the first stage of AMETI has already reduced the journey time by making transfers at Panmure viable, so the project overall is reducing it by more than 10 mins. Some much more expensive motorway projects have been justified for less time savings. And then they have failed to deliver the reliability of journey times that seperated public transport projects have delivered. … while increasing walking travel times so much that people stopped walking. But they didn’t count those. Travelers will then will one direct travel mode from Botany to Britomart as oppose to 2 travel modes as at present, which what PT travelers prefer. Since the route is protected and express. They should increase the bus speed like NEX – 80kmh and have traffic light priority. That would make a difference to journey time. An average peak time bus / train journey from Howick to Britomart takes between 65 to 70 minutes. If this project can take 20 minutes off that, it’s a massive improvement. Property demolition has already been happening for weeks though……………. So now we are getting rid of the stupid Panmure roundabout, can we also get rid of the stupid Royal Oak roundabout? Lets make Auckland a stupid roundabout free zone! Don’t forget the 5 leg roundabout in Avondale, corner of Great North Road, St Georges Rd, Wingate Street and St Jude Street. Ah crap you’re right. Also Blockhouse Bay is 5 legs. And the two stupid roundabouts on Dominion Road that are way too small and have pedestrian crossings right on the exits. What was with the old Auckland City Council and bad roundabouts? Lobbied by the glass sweepers union? Why 1.4 billion when Northern busway was 300 million? Bridges I presume. The good thing about roundabouts is that it avoids high speed crashes from red light runners, as they are forced to slow down. The Dutch seem to like them. An NZTA report in May 2012 stated that roundabouts result in far fewer fatal and injury-related accidents than signalised intersections and recommended that roundabouts should be the preferred option for multi-arm intersections. The AMETI planners have ignored that report and recommendation. That NZTA report looked at roundabouts that allow little or no pedestrian activity, and specifically excluded cycling by looking at dutch roundabouts where cyclists are on a separate cycleway. They then concluded that roundabouts are safe because there are no pedestrians or bikes around to get hit by cars. They also included zero mention of public transport, let alone a busway leading to a major rail interchange and local bus transfer hub. Naturally, if you ignore that pedestrians, cyclists and public transport, and are only concerned with traffic outcomes, a multilane roundabout in the middle of town centre looks like a good idea. Luckily the AMETI planners realise that there is a much more complex situation at Panmure that a highway intersection in isolation. They realise it is the middle of a town centre, that it needs to improve conditions for pedestrians and cyclists moving around the town centre or accessing the transit, that it includes a busway, that it includes local buses, local drivers and local residents. There seems to have been some concern from Panmure locals that the new intersection will not have the capacity of the old roundabout, and also that the new layout will push more traffic through the panmure shops. Is this concern well founded, or will it all turn out OK? On another note, does anyone know how the Panmure shops will be served by bus services once the busway has been build? It is 900 meters from the Train Station to the end of the shops, which will probably be too far for many of the mobility impaired people who currently visit the shops on the bus. I just noticed that the 743: Onehunga to Glen Innes via Panmure, is marked a future frequent service. If it became a frequent service then it would provide a suitable connection between Panmure Station and Panmure Shops. Related to your question, perhaps, is another one: What are the AT equivalent of NZTA’s Post Implementation Reviews? Stage 1 of Ameti provided a by-pass of the roundabout, which should have reduced traffic through there. Will it get a PIR? How do the traffic volumes and travel times match those predicted by the modelling? If Stage 1 has not tracked according to the modelling, should the later stages be modified to try to capture (by perhaps, a different planning technique) any improvements the Stage 1 failed to capture? In other words, had Stage 1 achieved the intended benefits, would traffic through the roundabout be a local concern? Stage 1 (the Te Horeta Road) definitely improved the conditions on the Panmure Roundabout by taking the north-south traffic from the Morrin Road industrial area out of the mix. However, the proposed new intersection will completely undo all of that good work by forcing Jellicoe Road traffic to find other routes through Panmure instead of being able to access the roundabout as it can now. One thing I notice from so many commenters here is that they seem to think this issue is only and exclusively about commuters heading to and from the central city from east of the Tamaki River. In fact, the Panmure Roundabout offers huge freedom of movement for ALL kinds of traffic – including large amounts of commercial traffic that operates all through the day – from six different directions. Central city bus/train commuters are not the only game in town. Another issue about the Te Horeta Road that people don’t understand is that vehicles carrying any kind of hazardous goods are banned from using it, due to the underpass section that combines the cycle lane and close proximity to the rail line. That leaves only the Panmure Roundabout for those kinds of vehicle loads. If they can’t use the roundabout, there is nowhere else for them to go. Good point re the hazardous goods issue, but can’t imagine that would be too common? One thing is once the Stonefields development has pretty much finished I would expect traffic to settle down through here a bit. Lunn Ave was pretty congested while they upgraded that intersection & was perhaps when a lot of that building was going on. The hazardous goods issue is probably more common than you might think. It must be remembered that much of that commercial traffic is coming from and going to the Morrin Road industrial estate. And as Auckland Council has long-term plans for increasing industrial activity there, it is likely to increase over time. Also, the completion of the Stonefields estate will actually add more demand on the Jellicoe Road/roundabout route because of the extra numbers of people who will move in there. Finally, there is another public safety issue involved here: the large Mount Wellington Fire Station is based at Pilkington Road and its trucks regularly take the Jellicoe Road/Panmure Roundabout route when heading east, west or south on emergency calls. If that route is blocked off – as the AMETI Busway intends to do, that means the fire trucks will have to compete with other traffic in the Panmure Town Centre to get to an emergency – with fewer options for avoiding it. There really is far more to the daily function of the Panmure Roundabout than just getting commuters to and from the central city. Fire stations can easily be relocated (perhaps to Morrin Rd), this looks like a good housing location for some apartments. Not sure what other locations/countries do to cope with tunnel route restrictions for hazardous vehicles near train lines but perhaps they can be restricted to non-peak or night time only access. Stonefields estate residents will have access to public transport albeit not that best street design for bus routes. The frequency of which can easily be increased if necessary. A think a lot of your fears about the traffic impacts are overly pessimistic, traffic always finds the easiest route. A couple of mins going backwards to then come around a new way won’t be that bad. Other people will choose to walk or cycle or catch the bus or not make a trip at all. I suspect the traffic will just be much the same as now. Restricting turns, making things one way or bus only can all be done afterwards if necessary on any other roads. It certainly has its challenges around there with the old Quarry, the mountain, basin & river all restricting access. I think you are clutching at straws there. Emergency services vehicles are allowed to do things that regular vehicles can not, a Fire engine would still be able to turn right out of Jellicoe and go through the new signalised intersection as long as it had its lights and sirens on. Sorry Jezza, but if you think that, then you really haven’t understood the intersection design at all. The intention of the design is to guarantee that nothing can turn right out of Jellicoe Road. I am a member of the AMETI Community Liaison Group and have sat in meetings with representatives of the Fire Service and other emergency services who have said that they would not want to risk meeting on-coming traffic head on coming off that intersection. So please enlighten me as to your superior knowledge of the subject. Grant, that is not just any Fire Station “that can easily be relocated”, it is the Region 1 Training Centre and it is a major facility. Have you never seen it? And if you “suspect the traffic will be just the same as it is now”, then you really don’t understand Panmure at all. I do, because I have lived here most of my life and I have been following the AMETI project closely for 12 years – and John Banks’ similarly-flawed Eastern Transport Corridor before that. And when I say I have been following AMETI, I mean I have attended every “public consultation” session held about it in Panmure (and some in Pakuranga and Howick), written multiple submissions, presented in person to the current Auckland Council AND the former Auckland City Council; helped to organise and front public meetings on the issue; submitted and presented to the AMETI Stage 2A Notice Of Requirement Hearings Commissioners, and even spotted a $400 million discrepancy in the projected costs being quoted by Auckland Transport to the Auditor-General’s report to Parliament compared to the cost being quoted by Auckland Council to the public. The fact that I was the only one who picked that up shows that critical political oversight of the AMETI project has become dangerously weak in the 12 years that it has dragged on. The figures I have quoted in these discussions about projected traffic increases in Panmure haven’t come out of thin air. They are Auckland Transport’s OWN figures, so I am not just making all this up. I’m afraid that if the most ardent supporters of the AMETI Eastern Busway were honest with themselves, they would concede that they have never really considered the impact of the design on Panmure at all and are just guessing and hoping that everything will be OK. I have done the hard research – and I can tell you that it won’t. Sorry – rant over. But I do get very tired of people who don’t live in Panmure casually dismissing the concerns of those of us who do. Extra road capacity was introduced, in the form of Te Horeta Rd. This appeared to relieve the roundabout, as you observed. However, the effect is short term. By also inducing traffic – which is continuing to rise, as you can see in the figures above – locals will suffer from traffic not just through the roundabout (and that will eventually be just as bad as it always was, even if they do nothing further) but on all the local streets where the traffic trips start and end. This is real, Keith – people are taking trips they wouldn’t have taken prior to Te Horeta Rd. It is a direct and known effect of adding road capacity, but NZTA and AT don’t model it correctly. Stage 1 has thus introduced traffic problems. Jellicoe Rd should have had a block on it when Te Horeta Rd was introduced, which allowed only Hazardous Goods Vehicles, Buses, Emergency Vehicles through. Probably a few other blocks should have been added too. To serve locals, you must first make it safe for people to walk and cycle around, including to the bus stops. Then you can remove traffic – not in some superficial and temporary way, but by actually encouraging mode shift. You’re right to be questioning the AMETI project. I’d start by asking why they aren’t just converting lanes to bus lanes and are instead retaining the road capacity. Ah, I hadn’t realised that there was a raised median at that intersection. There are three possible solutions, get rid of the raised median to make it easier for fire trucks (or at least make it easy to drive over), have the fire trucks go down Forge Way or give Jellicoe priority over Queens Rd. You raise two valid concerns – extra traffic on Queens Rd and lack of buses in the town centre, the rest is just concern trolling. Both of these can be mitigated, the first would be by making Queens Road hard to get through, make it narrower and put in more pedestrian crossings. This will limit the number of vehicles that try and use it as a thoroughfare. Secondly put on some local bus services that ensure at least some buses on Queens Rd and other parts of Panmure for those less mobile. To be honest it is completely contradictory that you are concerned about people’s mobility and want the roundabout to stay. The roundabout is the single biggest impediment to mobility in Panmure as it requires a significant detour to safely walk around it. Concern trolling. That’s one I haven’t heard before but I guess it’s one way of dismissing an opinion. Nevertheless, I take it Jezza that we are both in complete agreement that forcing increased amounts of traffic through the Queens Road shopping centre would be an incredibly bad thing for Panmure, yes? And yet, that is EXACTLY what the AMETI planners are intending to do because they know it is the only way that they can make their chosen design of intersection work. Their own projected traffic figures as presented to the Stage 2A NoR process prove this. They have even gone as far as to suggest that doing this would be a really good thing for Panmure as it would “bring more business to the shops”. Seriously! I believe that forcing greatly increased amounts of traffic – including a potential doubling of HCV traffic – to go thundering through Queens Road, Pilkington Road, Tripoli Road and Church Crescent would not only cause increased congestion in Panmure but also bring greater dangers to pedestrians and cyclists on those roads – you know, that issue that I have been sarcastically accused of not caring about by other commenters here. So if you are in agreement with me, what I don’t understand is why you are arguing with me while defending the AMETI planners. Keith, trucks should not be going through Queens Rd. I completely agree. And it’s worse than what AT say – I’ve seen several projects where truck traffic increases more than what the modelling predicts. Wherever it is AT thinks these trucks are coming from, they can and should design a way to stop them coming through the town centre. What am I missing, AT? Where was I sarcastic? I’m afraid you’ve taken my comments in a way totally unintended; I was simply suggesting that designing solutions for different user groups produces different results. I have always seen that you care very much about your community. Completely agree with you regarding the Panmure Town Centre. I’ve never said AMETI is perfect, however it is a vast improvement for Panmure locals on foot or or on a bike and for Eastern suburbs residents travelling by PT, the groups we should be prioritising. The relevant problems you have mentioned could be mitigated without the terrible current arrangement, which just caters for anyone travelling in a car, especially non-locals. Hi Heidi – it wasn’t you I was referring to. I was referring to earlier comments from others. Actually, there is a LOT of concern from many Panmure locals about the design of the intersection to replace the Panmure Roundabout – and there has been from the very start. AMETI planners themselves have conceded that the design will force up to 30 per cent more non-commuter traffic volumes (including Heavy Commercial Vehicles) into and through the Panmure Town Centre and surrounding residential roads. Church Crescent alone is expected to suffer up to 4400 more vehicle movements per day as a result of the design. There are serious problems with the design that the planners know that they cannot fix. The approach is to simply let Panmure suffer the brunt of the downsides of AMETI in the belief that the project’s supporters won’t care. Seems like a relatively simple solution would be to give Jellicoe Rd direct access instead of Queens Rd at the new intersection that replaces the Panmure Roundabout. Do you know why they haven’t done this? Yes, it’s the blocking of the Jellicoe Road access that will cause all of the problems. But simply blocking off Queens Road instead will cause even more – as that is the only westward exit from Panmure for people who live here. Effectively, it would trap Panmure residents in our own town. AMETI planners have always known this. I don’t know the percentage of the traffic increase on Church Crescent – only the numbers that the planners stated. Interestingly, they gave percentages for all the other routes but not that one. Queens Road is a town centre, there is no reason to facilitate vehicle movement through there at all, whether it is local traffic or not. There are other ways to access properties in Panmure without a rat run through the town centre, sure they might take longer but drivers really shouldn’t expect priority in a town centre. Keith, is there someone on the CLG who has studied this deeply like you have, but is advocating for the 8 year olds and the 88 year olds who can’t drive? And everyone else who doesn’t? It’d be worth matching up with them and swapping notes. “it would trap Panmure residents in our own town.” Currently, anyone not driving is trapped in your town. It’s too dangerous to walk around, even to the bus stop. Did you know that only 10% of our high school students get the physical activity required for their health? And that the CEO of AT has acknowledged the role our car-dominated transport network plays in this – he has pointed out that high school students aren’t walking on our streets to get places because they know it’s not safe. We had a doubling of DSI in high school students in three years! You’re right to be concerned about the local residents. But your ideas currently are not looking out for the vulnerable in your community. Take a new look, through the eyes of, say, a 14 year old who has no taxi driver parent, and design for them. The 14-year-old needs slow residential streets, ample pedestrian crossings, wide footpaths, a good cycle network, a fast bus network with bus stops integrated with the pedestrian amenity, priority at intersections so their travel times aren’t made huge just through lack of priority. None of this is available. Fix it and the mode shift will be enormous, and traffic volumes will be lower. Trust me, Heidi, I know all about the vulnerable in my community. I look after two of them. When Auckland Transport – the geniuses behind the AMETI project – announced the thoughtless removal of long-standing bus services on Matapan, Kings and Dunkirk roads in order to make their network “more efficient”, I campaigned for residents on those roads to submit to keep those services for the benefit of exactly those people you seem to think I don’t care about. AT ignored ALL the submissions (including my own) and removed the service anyway, meaning that those 8 and 88 year-olds now have to walk even further to catch a bus – some of them up to a kilometre more. Do you still view me as uncaring about those people? Good on you, Keith. Your focus on the need to facilitate vehicle movements through the town centre were what informed my (incorrect) assumption that you’re focused on the driving amenity more than the vulnerable user amenity. Sorry about that. It seems to me you’re after the right solutions, and need some more options to enable the residents to get the amenity they need while suffering less from the through traffic. Through traffic is what’s killing many suburbs – mine is the same. And that’s why it’s terrible that the Council and government are allowing greenfields development, which simply adds to the traffic everywhere. But that’s another subject, sort of. Those timed bollards are an interesting idea and saves on complicated transponders etc for local resident cars. Also do you know what the % increase of vehicles on Church Cres is? Actually Jezza, there is EVERY reason to facilitate traffic movement through the town centre. Look at the map – for thousands of Panmure people who live east of the Panmure Town Centre (as I do), it is the ONLY viable route west to the E/P highway or Ireland Road. There is no other simple way to access those routes without forcing even more rat-run traffic through steep, winding residential roads. Queens Road wouldn’t need to be cut off, it would just be joined to Jellicoe Rd and have indirect access to the main intersection. If this isn’t good enough there are other alternative options. We are talking cars here, they can handle hills just fine, we shouldn’t be designing the entire transport network around people whose cars are not powerful enough to make it up a hill. Yes, this does make local car access worse, it also makes longer distance car trips worse. In this case AT are following guidelines which state that the pedestrians are higher priority than buses, and buses are higher priority than cars. Do you realise that you are now actually arguing AGAINST the AMETI planners’ design yourself? The planners are determined that Jellicoe Road traffic will NOT get access to the new intersection and that the Panmure Town Centre/Church Road route must accept the extra traffic volumes (including a potential doubling of HCVs) to compensate. By suggesting that through-traffic traffic should be restricted from the Panmure town centre, you are saying that Panmure Town Centre should take less traffic – not more. The AMETI planners themselves would not accept your argument. I think general traffic will be fine with Te Horeta Rd & let’s face it, the Reeves Rd Flyover diverting a lot of longer distance rat-running through Panmure town ctr. Even localised traffic more north east of Panmure, say, may find it fine to go via Te Horeta. Trucks & the like would more likely divert over the Waipuna Bridge. The bus option will so much more attractive to those coming from East that general traffic will take care of itself. The P&R should probably be removed or at least they should start charging for the parking, having one there near the big intersection is ridiculous going forward. Church Cres does seem to be an important road here, and one that would benefit from residents and emergency vehicles only dynamic bollards. The AMETI planners themselves would vehemently oppose you on that score, Heidi. They are relying heavily on Church Crescent to take a big increase in through-traffic to compensate for the loss of 50 per cent of general traffic capacity on Lagoon Drive and the major restrictions on Jellicoe Road traffic that will be caused by their new intersection design. To do as you suggest would undermine the planners’ intentions. They know full well that their AMETI busway design cannot work UNLESS they force that extra traffic – including a DOUBLING of Heavy Commercial Vehicles – through Panmure and down Church Crescent. I’m working here on the figures that Auckland Transport themselves produced for the Stage 2A Notice Of Requirement process, not something I have just made up. These are the points we have been making for years about the design of the AMETI project but people who don’t live in Panmure either can’t – or won’t – see it. Keith, I fully believe you. Have they been so bold as to state this? This sums AT up for me – on one hand they say they’re improving PT and conditions for walking and cycling. On the other, they’re enabling and inducing traffic, particularly heavy vehicles. I’d like to see AT challenged on this Church Cres situation. I am ‘informed’ that the busway can no longer be later upgraded to LRT at a later date. If this is the case, why did this change so late in the brief and why was more not said about it? Yes, if that’s true, I’d like to hear the rationale. Don’t know if that is true, it’s surely “somewhat” future proofed. I think I got told the route corridor would be but not necessarily the engineering of it all…hopefully the bridge are…that actually rings a bell in my vague memory. I thought so too, but apparently not. I would love for the GA crew to look into this. Possibly because they realised that the Lagoon stretch of the route up to the intersection would be too steep for LRT – and also the fact that you would effectively have to cut the town of Panmure in half to make it work. That may not matter to people who don’t live in Panmure, but for those of us who do, it would pretty much destroy the town in the process. Just a point here that some people may not be aware of regarding the Panmure Roundabout. In May 2012 – smack in the middle of the AMETI planning process that planned to replace the roundabout with a complicated new signalised intersection, the NZTA released a report titled Improved Multi-lane Roundabout Designs For Urban Areas. In this report, a series of comparisons are made between a number of signalised intersections and roundabouts in New Zealand in which the number of approach roads and the traffic volumes are statistically comparable. One of the three authors of that report was Duncan Campbell of Auckland Transport – the same agency whose AMETI project team is determined to replace the Panmure Roundabout with a hugely-complex new signalised intersection incorporating a busway. Just over a year ago, I asked an AMETI planner if their team was aware of the report. He said yes. Interestingly, they never once referred to it in their “public consultation” sessions. It appears the AMETI planners did not want anyone to know about it. That report is quite correct, however the AMETI team also had to take into account how to improve the terrible pedestrian access and also how to run a busway through the intersection. This could have been solved by having a smaller roundabout, with either pedestrian crossings or pedestrian lights on the edge of it and a signalised busway running through the edge of it, but this would have made traffic much worse than what we currently have. As the main destination for pedestrians moving in that direction is the railway station, this problem could be easily and more safely resolved with pedestrian and cyclist overbridges at Jellicoe Road, Lagoon Drive and the E/P highway, as there are in many places around Auckland. There is ample room for these and such a solution would completely separate pedestrians from other traffic. But again, the AMETI planners will not even consider the possibility. I can’t think of any at grade intersections that have pedestrian or cycle over-bridges, which ones were you thinking of? A cycling over-bridge would need a long approach at either end to ensure a gentle gradient, not sure how this would fit in at this intersection. Is the comparisons “in which the number of approach roads and the traffic volumes are statistically comparable.” mean between each approach road? My impression of Panmure is that it’s pretty even during off peak periods but is very different during heavy commute times. Hence the busway & light control needed….not to mention pedestrian access. No, it means comparable with signalised intersections with the same numbers of approach roads. So the statement that “an analysis of 40 intersections in the Auckland region demonstrated a 47% reduction in vehicle occupant injuries” means that roundabouts have a 47% lower incidence of those kinds of accidents (that’s huge when you think about it). That is because drivers approaching a roundabout instinctively slow down and actively look for traffic approaching from their right, whereas drivers approaching a green light at a signalised intersection usually maintain their approach speed on the blind assumption that all will be well and traffic from other directions is always going to stop. That’s why collisions (usually T-bone hits) at signalised intersections are invariably far worse in terms of injuries and deaths. The accidents are invariably caused by people who run, jump or fail to notice a red light. To underline this fact, during the Notice Of Requirement for the AMETI Stage 2A process, Auckland Transport’s own statistics revealed that there was a greater incidence of serious injury accidents and fatalities at the signalised intersections at Pakuranga/Ti Rakau/Reeves Roads than on the Panmure Roundabout. And that included accidents involving pedestrians an cyclists – the people who were supposed to be kept safer at those intersections. Keith, I can’t download the NZTA report at the moment, but the abstract highlights a few reasons why it might not present a suitable solution here. It mentions reduction in vehicle occupant injury rates, “adequately catering for pedestrians and cyclists… in many cases”, and the Dutch Turbo Roundabout. A reduction in vehicle occupant injuries has been the focus of safety work for a long time, and good improvements have been made. The RSBIR shows the cultural and regulatory changes required to get that back on track. What has NOT been the focus has been lowering the DSI of vulnerable road users. In many ways, the traffic engineers don’t even have the data they need to design well, in NZ. For example, they need statistics of how many people are walking at a location before the injury rates have any meaning, and for an example of how much this data has been valued by the NZTA: The pedestrian data for roads surrounding the Waterview Connection were “lost”. “adequately catering for pedestrians and cyclists… in many cases” does not suggest this report in any way is focused on a design intended to improve safety and therefore amenity for pedestrians and cyclists. It won’t be focused on changing mode share. It won’t meet Vision Zero guidelines. It won’t keep your community safe. I’m not sure why you think a roundabout is a better solution here. It keeps people in their cars and off their bikes, because it’s just dangerous. There are Vision Zero roundabouts, which only work by reducing the number of lanes to one from each direction. But I’ve only seen them applied in really really car dominated places without significant vulnerable users, so I’m not even sure they’d work here. interesting video link, never seen a Dutch one that doesn’t work on YouTube before. Watched the whole thing and love the guy cycling that just flukes it coming along at the right time and didn’t have to even wait. Had dogs, children & even wheelchair users all waiting and taking a risk crossing. There’s quite a resistance in the Netherlands to these roundabouts. It would be stupid for us to adopt them. That one in the video is so dangerous. And yes, we had a chuckle about how that guy was the only one who could go at that moment, and that was because he had some momentum to get him across in time. Hope his reflexes are good for when the timing doesn’t work like that. Basically, nothing works for the sustainable and healthy modes if traffic volumes and speeds are too high. That’s what we have to focus on. OK, here’s another question about AMETI. This latest release states “When the $1.4b busway is fully operational…” $1.4 billion? That’s a whole new figure! When the project began 12 years ago, the public was given a figure of $1.1 billion. However, within a couple of years, this stated figure had risen to $1.3 billion, and then, a couple of years after that, to $1.5 billion. This became the most widely-quoted figure in many official and media reports but, in 2011, Mr Rick Walden of Auckland Transport told an Auckland Council Transport Committee meeting in a report to their meeting Agenda dated 5 April 2011 (p74. Expected Costs) that the full cost of AMETI could be between $1.55 and $1.95 billion over its lifetime. This variation, he explained in the report, was the difference between a project with kerbside stops and one with a dedicated busway. In October 2015, a report by the Auditor General to Parliament contained the statement that the cost of the AMETI project would be $1.1 billion dollars (a return to the original 2006 figure). At the same time, however, the Auckland Council was still publicly quoting the figure of $1.5 billion (source: Five years as a united Auckland – Part 3: Transport, 29 October 2015). A letter I wrote on behalf of the Panmure Community Action Group to the Auditor General about this clear discrepancy resulted in an apology to the Auditor General’s Office and the Auckland Council by Auckland Transport, but no real explanation of why the figures being quoted to Aucklanders and their elected representatives have varied so widely over the years that the AMETI project has been in the planning stages. So even though Parliament has been given a figure of $1.1 billion, now Auckland Transport is saying it will be $1.4 billion. This leads to an obvious question: What is the true projected cost of the AMETI project (including everything that has been spent in 10 years to date on planning and Stage 1), and have the public been misled at any time by those in charge of it? It is a lot of money whichever figure you use. Panmure would be a whole lot better off with a much, much cheaper solution. Goff has instructed AT to reallocate road space to PT and active modes. That’s what should have happened here. The Panmure Bridge should have become PT and active modes only. This would have seriously improved Panmure for residents, and it would have created huge mode shift to PT and active modes. People who must drive between Pakuranga and Panmure would still have been accommodated on Waipuna Bridge. A longer distance, but the Panmure part of the trip would have been on much less congested roads, so not necessarily longer in travel times. That’s what a good, value-for-money design for local residents, commuter flow, environmental improvements and access via public transport and cycling and walking would be. This AMETI design is expensive because it is about traffic flow. To put it down as a Public Transport project is a rort. Keith when is AMETI stage 2 going to be completed? Hi Alan. At the moment, they are talking about two years of construction for this stage alone. But bear in mind that, if the AMETI planners’ original timeframe had been accurate, the entire AMETI busway all the way to Botany Town Centre should have been completed two years ago.